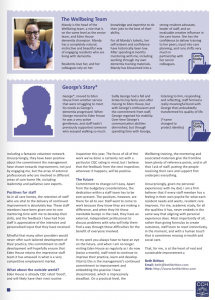 Thank you to the Oxfordshire Association of Care Providers (OACP) for asking me to share an example of my consultancy work for Issue 4 of their ‘Talking Care’ magazine. I chose to focus on my work with a Christadephian Care Home in Coventry, under the title ‘Improvement for all-time, not just crisis-time’. The feature includes details of the work I’ve undertaken and case studies from a staff member and a resident.